5 8 S U P P L E M E N T T O O U T P A T I E N T S U R G E R Y M A G A Z I N E A U G U S T 2 0 1 5 P neumatic tourniquets are used many thousands of times per day in ortho- pedic cases, facilitating procedures by reliably establishing a bloodless surgical field with a high level of safety. 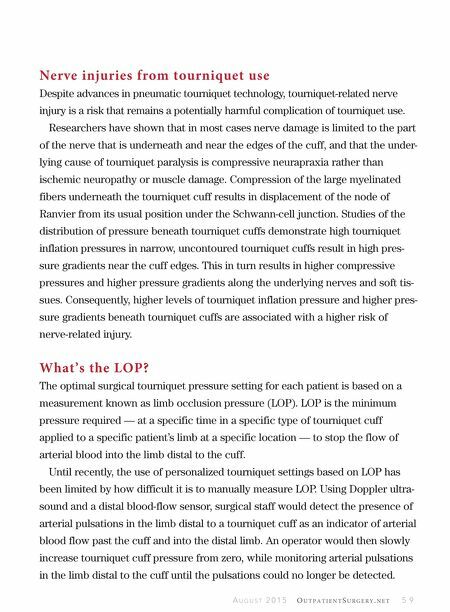 But now there's a new concept in tourniquet They deliver more efficient application of cuff pressure to the limb, letting you use lower and safer tourniquet pressures. It's Time for Personalized Tourniquet Systems Jim McEwen, PhD Vancouver, Canada z TOURNIQUET PARESIS To reduce the risk of tourniquet-relat- ed nerve injuries, base the tourniquet cuff pressure on the measurement of the limb occlusion pressure. Pamela Bevelhymer, RN, BSN use: personalized tourni- quet systems — the low- est limb occlusion pres- sure needed to occlude blood flow and create a clear, dry surgical field. 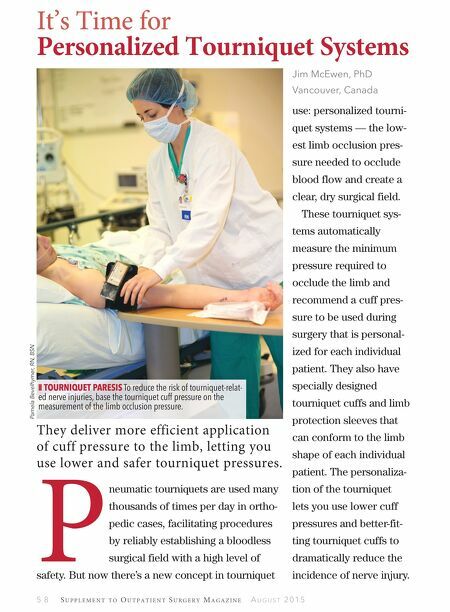 These tourniquet sys- tems automatically measure the minimum pressure required to occlude the limb and recommend a cuff pres- sure to be used during surgery that is personal- ized for each individual patient. They also have specially designed tourniquet cuffs and limb protection sleeves that can conform to the limb shape of each individual patient. The personaliza- tion of the tourniquet lets you use lower cuff pressures and better-fit- ting tourniquet cuffs to dramatically reduce the incidence of nerve injury.